This summer I did a whole series on the chakras in my yoga classes and just finished up another series around the 5 Elements. In the Yoga & Ayurveda Teacher Training I'm taking, we learned about the 5 elements, and what I learned blew my mind and that's why I created sequences around them for my yoga classes. 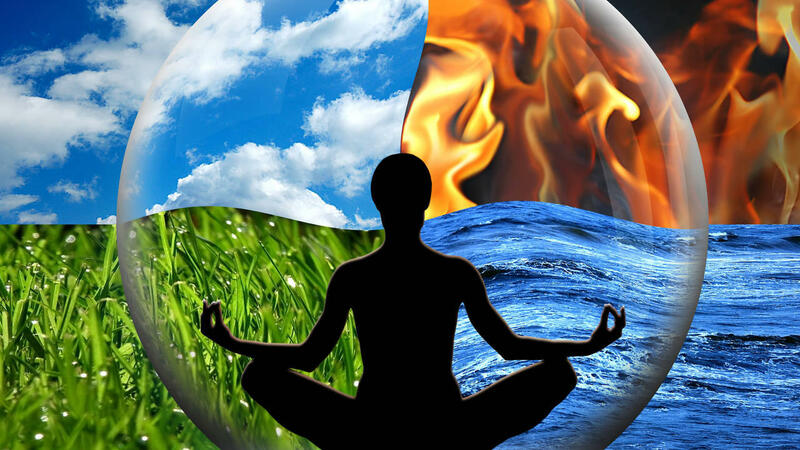 Ayurveda, the traditional medicine of India, says that all of creation is formed from the 5 elements coming together. The 5 elements are Earth, Water, Fire, Air and Ether. Each element has certain qualities, and they also all have a relationship to each other. Once you understand this, you can use the 5 elements to help balance your body and mind. When you think of Earth, what do you think of? The qualities of earth are solid, heavy, dense, immobile, hard, cool, grounded, stable. In the body think in terms of the dense components such as bones, muscle & fat tissue, joints, ligaments and tendons. You can connect to the earth element any time you feel scattered, disorganized, fatigued or burnt-out. It will also help to balance vata dosha. If you travel a lot or have a really busy or fast-paced lifestyle, you can also benefit from connecting to the earth element. The easiest way to connect to the earth element is to visualize yourself like a mountain while standing in Mountain Pose (Tadasana), which you'll see in the yoga sequence if you decide to download it. The qualities of water are fluid, cool, mobile, liquid, nourishing, refreshing, lubricating, purifying. In the body think of circulation; it's the way nutrients, hormones, blood cells, oxygen are transported throughout the body. This element nourishes the bones, joints and muscles (the earth components). Connect to the water element any time you feel stuck or rigid in the body or mind. Go for a swim, stick your feet in a soothing foot bath, practice a slow, flowing yoga practice or drink a nice glass of refreshing water. The qualities of fire are hot, sharp, light, erratic and radiant. Its associated with energy, transformation and illumination. In the body think of fire as the heat for digestion. Fire also offers the power of transformation to help us digest our life experiences so we can move through and integrate those experiences. Fire also helps you to focus and concentrate on taking action on the desires you have in life. You can connect to the fire element by visualizing a flame at the navel center. You can also practice trataka, which is gazing at a candle flame to boost your focus and concentration. Or you can focus your yoga practice on the core, creating heat in the body. Air is different from the other elements in that it is invisible. You can sense air element through its effects on the material world; think tornado, hurricane, a gentle breeze or feeling a cold wind on your face. The qualities of air are light, formless, cold, dry, mobile and is associated with positivity, freedom, openness. In the body think of the breath -- the life force that sustains us. What happens when we have too much of the air element? Our mind can become restless and overactive. If we have too little air the mind can become dull and lethargic. So, if you have monkey mind (an overactive mind), try visualizing yourself as a mountain to bring in some grounding (bringing in the earth element). If you're mind feels dull, try putting on music and dancing/flowing with the beat or practice downward facing dog pose to plank pose, moving back and forth like a wave with the breath (think water to stimulate creativity). Or practice a breath technique like bhastrika to invigorate the mind. Ether is sometimes referred to as space. The qualities of ether are vast, spacious, expansive, subtle, limitless. It is the element that encompasses all the other elements. In the body think of our spacious organs such as the stomach, intestines and lungs. Could you imagine not having space in these organs? In our mind it is helpful to create space around thoughts, especially those that are limiting and negative. This way we can take those incessant thoughts and not get so attached to them or identify with them as much. When we connect to ether element we can also see new perspectives and have different vantage points and see our limitless potential. To connect to the ether element, I like to practice yoga poses that help me feel more spacious like backbends or to feel more expansion like one of my favorites, Half Moon Pose (Ardha Chandrasana). I also love to practice bhramari breath (bumble bee breath). Once you understand the elements and their qualities, you will be able to choose what you can do to help you balance your body and mind, which is quite empowering! 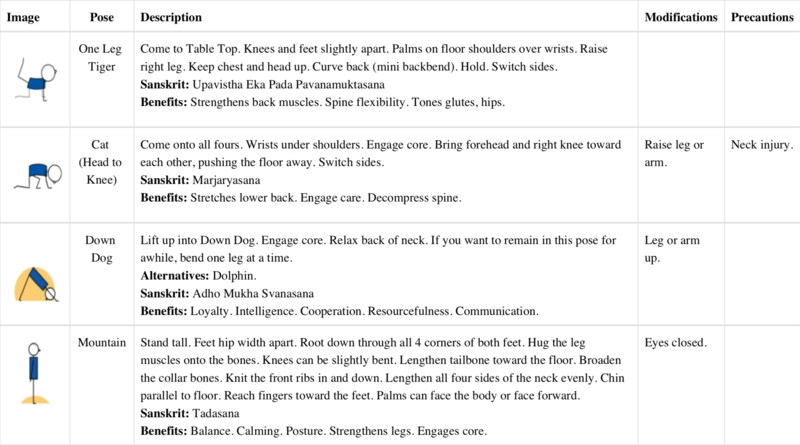 5 Element Yoga Practice - for you and it's free! I created a 5 element yoga sequence that I'm teaching in my classes this week. It includes fun illustrations and pose names + instructions, benefits and more. I also included a description at the top to explain how to move through the 5 elements as you practice the sequence. Ps. If you have any troubles receiving your free PDF sequence, hit the Contact link in navigation bar above and send me a message. Pps. Be smart & kind to yourself - listen to your body. If you’ve never practiced yoga before or have health issues check with your medical practitioner first.